The PK-5 Flexicam from A4-Tech combines a 1.3 megapixel image sensor with the ultimate stand. 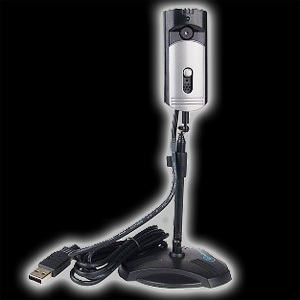 The telescoping, rotating and bendable stand lets you position your camera for optimum viewing angle. No more having the camera right in front of you - now you can put your best face forward. Perfect for times when you need to provide different views. This camera can be positioned wherever you want it. The built-in microphone provides clear sound and echo-free audio for relaxed communication. The package includes ULead Photo Express and Ulead Cool 360 and is equipped for integrated performance with both programs.